Experience extraordinary body and encourage new hair growth while keeping your hair healthy and balanced with this luxurious Alterna Life Solutions Volume Restore Conditioner. It has been created specifically for use on fine and thinning hair. Using unique technologies to expand the hair from the interior of the hair shaft Alterna Life Solutions Volume Restore Conditioner keeps the hair cuticle closed so that it retains precious moisture and colour. Weightless thickening agents define hold and protect your hairs volume all day long while fighting common factors of hair loss. 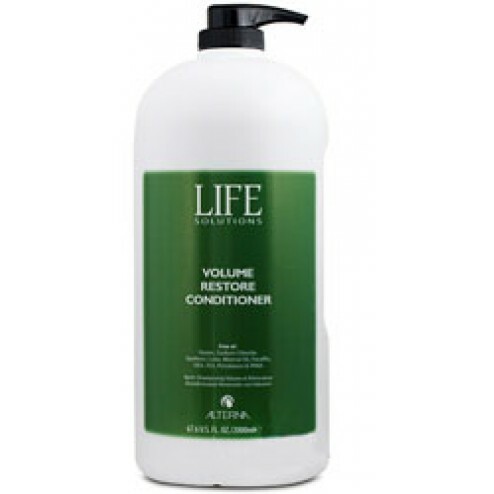 - Shampoo with Alterna Volume Restore Shampoo. Aqua/Water/Eau Cetearyl Alcohol Saccharomyces Lysate Ferment Saccharomyces Zinc Ferment Saccharomyces Copper Ferment Polygonum Multiflorum Root Extract Rice Amino Acids Wasabia Japonica Root Extract Silk Amino Acids Retinyl Palmitate Azelaic Acid Calcium Pantothenate Calphostin C Magnesium Salicylate Carboxyethyl Butyric Acid Niacin Ornithine Decarboxylase Threonine Zinc Gluconate Melanin Silantriol Superoxide Dismutase Bromelain Camellia Sinensis Leaf Extract Cinchona Succirubra Bark Extract Coptis Japonica Extract Cymbopogon Schoenanthus Extract Gastrodia Elata Root Extract Ginkgo Biloba Leaf Extract Nasturtium Officinale Flower/Leaf Extract Papain Polygonum Multiflorum Extract Robinia Pseudacacia Flower Extract Royal Jelly Extract Foeniculum Vulgare (Fennel) Seed Extract Hydrolyzed Pearl Nelumbium Speciosum Flower Extract Nymphaea Alba Flower Extract Panax Ginseng Root Extract Zingiber Officinale (Ginger) Root Extract Algae Extract Lactoferrin Corn Oligosaccharides Phospholipids Phytosphingosine Acetyl Methionine Acetyl Serine Amino Acyl tRNA Synthetase Copper Lysl Oxidase Glycine Soja (Soybean) Seed Peroxidase Daucus Carota Sativa (Carrot) Root Extract Ganoderma Lucidum (Mushroom) Tyrosinase Lentinus Edodes Tyrosinase Paullinia Cupana Seed Extract Serenoa Serrulata Fruit Extract Magnesium Ascorbyl Phosphate Tocopherol Acetate Polyquaternium-10 Phosphorus Propylene Glycol Panthenyl Hydroxypropyl Steardimonium Chloride Cetrimonium Chloride Quaternium-82 Stearalkonium Chloride Hydroxypropyl Guar Citric Acid Diazolidinyl Urea Iodopropynyl Butylcarbamate Fragrance (Parfum) Linalool Butylphenyl Methylpropional Hexyl Cinnamal Blue 1(CI 42090) Yellow 5 (CI 19140).